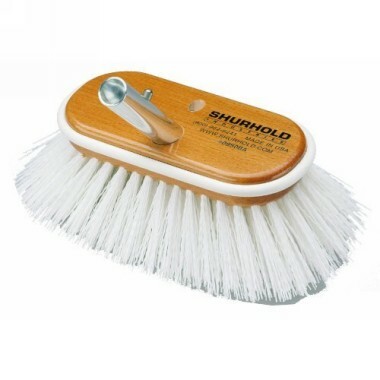 Shurhold's series of 6 inch (15 cm) deck brushes that easily and positively lock into any Shurhold handle. Each brush is based out of a solid wood block and has a rubber wrap around bumper to prevent marking the surface. Features white polypropylene bristles for teak, below the water line and other tough surfaces. These deck brushes are available in four textures: Extra stiff, medium, soft and extra soft.